One of the biggest and most shocking superhero movies in history, Avengers: Infinity War featured heartbreaking death scenes — and a lot of them. Fans watched in opened-mouthed horror as the intergalactic tyrant Thanos (Josh Brolin) murdered half of all life in the universe with the snap of his fingers, turning heroes like Black Panther (Chadwick Boseman), Scarlet Witch (Elizabeth Olsen), Doctor Strange (Benedict Cumberbatch), Spider-Man (Peter Parker), and more into space ash. It was hard enough being an audience member and seeing those beloved characters bite the dust, but it was even more difficult for the actors who had to film the sequences. As it turns out, the process was also incredibly confusing — and included more deaths than the theatrical cut of Infinity War. One death scene viewers didn't get to see in the film? Bruce Banner's. Actor Mark Ruffalo recently revealed that he did indeed shoot a sequence for Infinity War in which Banner, who couldn't Hulk out after the first few minutes of the film, falls victim to Thanos' ruthless mass killing. Speaking with Yahoo! Movies during a press junket for Avengers: Endgame, Ruffalo explained he wasn't sure whether Banner had survived or perished until he actually saw Infinity War in theaters, as the film's directors Joe and Anthony Russo had him shoot scenes for both possible outcomes of Thanos' Decimation. "I didn't know until I saw the movie," Ruffalo said of Banner's fate. "For one take, I did disappear, and then the other one I didn't." 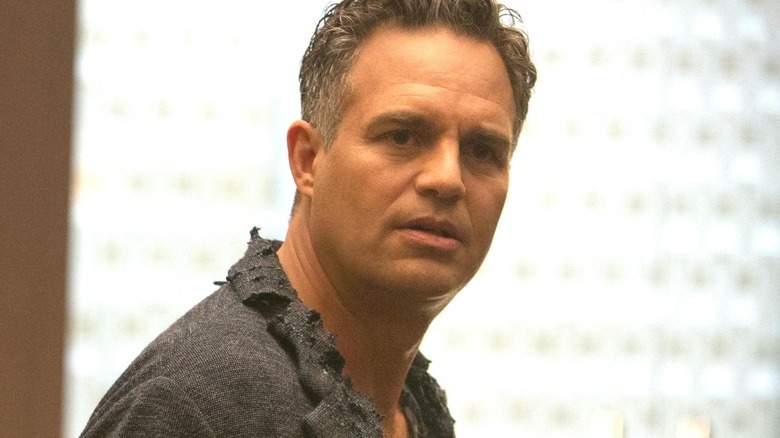 Ruffalo added that he was confident Banner would be amongst the fallen, partially due to the fact that his tendency to accidentally spoil Marvel movies has landed him in hot water in the past. "I was pretty sure it was gonna be me," he said. "It's like Survivor. It's like, who's gonna get kicked off the island? And I probably should've … It's like Project Runway for leakers." Keeping actors in the dark about the true events of a film is standard practice in the Marvel Cinematic Universe. The Russo brothers have admitted to giving actors scripts with fake scenes written in them, Marvel owned up to editing trailers in a way that purposefully misdirects fans, and MCU stars have time and again said that they shot contrasting takes, didn't know what was happening in the scenes they were filming, were only allowed to read their lines and nothing else, and weren't made aware of the movie's complete story until they saw it on the big screen. All these tactics are implemented to fulfill a single goal: stop anyone from spoiling things. Joe Russo previously explained that no one can be trusted with the truth — "it's a burden to bear for them" — and that he and his filmmaking sibling decided it was easier for the Infinity War and Endgame cast to not know everything, as it means they wouldn't have to hide anything during interviews or worry about what they could and couldn't discuss. Anthony Russo later told Geeks on Coffee that going to such great lengths to maintain secrecy has paid off because it has made it "a little bit easier" for actors to "edit themselves." "You take pressure off of people by letting them know less. It's less responsibility they have to edit themselves, so we've developed an elaborate process by which we try to only let people know what they absolutely need to know," he said. We can say with confidence that Bruce Banner will be back for Avengers: Endgame, but whether he survives this go-around is a mystery. The genius scientist is still struggling to go green — with Hulk remaining dormant in Infinity War even when the rest of the Avengers could have used his brute force to battle Thanos — and that might prove troublesome in the upcoming film. With any luck, Banner and Hulk can resolve their differences and come together (maybe as the sort-of-merged form Professor Hulk?) in Endgame to vanquish Thanos and bring back the dead.